Culture enshrines diverse resource elements that have potential to protect children against various forms of violence and abuse. Such elements include proverbs embedded in different languages. Proverbs are generally used in various forums and contexts to communicate messages, beliefs and norms relevant for social and cultural interaction. Some of these proverbs embed messages relevant for child protection and abuse. Available literature shows that the potential carried by proverbs has not been systematically studied and utilized for prevention of child abuse and promotion of child protection across different cultures. 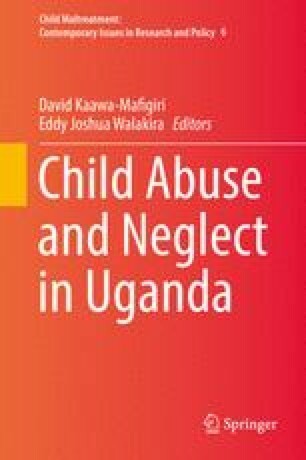 Based on data collected from three Bantu languages (Luganda – traditional language of the Buganda community, Lusoga – traditional language of the Busoga community, and Runyankole – traditional language of the Ankole community), the chapter examines the meaning and implication of proverbs for child protection. The paper concludes that proverbs carry latent messages for promoting child protection. However their use could also instigate attitudes, values and practices that expose children to abuse, neglect, exploitation and violence. Therefore, child protection programs should harness the positive cultural resources as well as develop culturally sensitive interventions that seek to deal with the messages in proverbs that do not match with key values and principles of child protection. Department of Health. (2011). Children first: National guidance for the protection and welfare of children. Dublin: Department of Health. http://www.hse.ie/eng/staff/Resources/hrppg/Children_First_2011_%E2%80%93_National_Guidance_for_the_Protection_and_Welfare_of_Children.pdf. Accessed 22 June 2016. Eynon, A., & Lilley, S. (2010). Strengthening national child protection systems in emergencies through community-based mechanisms: A discussion paper. Save the Children UK. http://www.resourcecenter.savethechildren.se/sites/default/files/documents/3292.pdf. Accessed 22 June 2016. Health Service Executive. (2011). Child protection and welfare practice handbook. www.tusla.ie/uploads/content/CF_welfarePracticehandbook.pdf. Accessed 14 Dec 2015.
International Labor Organization. (2013). What is child labor? http://www.ilo.org/ipec/facts/lang--en/index.htm. Accessed 14 Dec 2015. Keating, E. (2005). Language and culture. In Encyclopedia of life support systems (EOLSS). Paris: Eolss Publishers. http://www.eolss.net/sample-chapters/c04/E6-20B-07.pdf. Accessed 22 June 2016. Save the Children. (2007). Save the children’s definition on child protection. http://resourcecentre.savethechildren.se/library/save-childrens-definition-child-protection. Accessed 20 Feb 2016. Tschudi, F. (2006). Notes towards an optimistic view of restorative justice in international and intergroup conflicts. Paper presented on the Bar Ilan conference on Restorative Justice and Contact Hypothesis in Managing Ethno-National conflicts. Bar Ilan University, Tel Aviv. 5 March 2006. http://folk.uio.no/ftschudi/ubuntu.pdf. Accessed 20 June 2016. United Nations Children’s Fund (UNICEF). (2006). Child protection information sheets. http://www.unicef.org/publications/files/Child_Protection_Information_Sheets.pdf. Accessed on 22 June 2016. United Nations Children’s Fund (UNICEF). (2010). Strengthening national child protection systems in emergencies through community based mechanisms A discussion Paper. London: Child Protection Working Group of the UN Protection Cluster/Save the Children UK. http://www.savethechildren.org.uk/sites/default/files/docs/Strengthening_National_CPS_low_res_1.pdf. Accessed 22 June 2016. United Nations Children’s Fund (UNICEF). (2012). The state of the world’s children 2012: Children in an urban world. http://www.unicef.org.uk/Documents/Publications/state-of-the-worlds-children-2012-urban-world.pdf. Accessed 17 Sep 2015. White, A. C., Catsambas, T., & Monnet, M. (2002). Language, culture and health: The gender divide using proverbs to tackle gender inequities in health. Journal of Health Management, 4(2). doi: 10.1177/097206340200400211.